This weekend is the 3rd Annual Quilters Weekend at the Heinz History Center. I have developed an interest in quilting and local quilt shows for a few reasons. First – one of the most interesting events I attended because I wanted to blog about it was the Quilt show in July of 2008. Keep reading to learn more about the Pittsburgh Friendship Quilt. The program for the quilt show is one of the things that I keep on my desk. In thinking about quilting and this history of quilting – it is kind of the pioneer equivalent to modern day blogging and social media. Back in the day, way way back in the day before computers – were are talking Oregon trail back in the day (the actual Oregon trail – not the computer game), quilts and quilting were a way that women recorded history and shared information. Quilting was used to share information in the movement to abolish slavery. Pioneer women would write letters and send scraps of fabric to family/friends to be included in quilts (Pioneer Quits). Bible Quilt 1886 and Pictorial Quilt 1898 consist of numerous pictorial squares depicting either biblical scenes or celestial phenomena. Hand and machine stitched, they were made through appliqué and piecework, demonstrating both African and African American influences; they are notable for their bold use of these techniques in storytelling. One could say that friendship quilts were an early form of social networking. 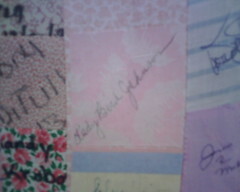 Friendship quilts were quilts made up of fabric signed by different friends (read more about friend ship quilts here). The Pittsburgh Friendship Quilt, sometimes called “Thousands of Pieces of Pittsburgh” and “The Pittsburgh Quilt”, was constructed at Pittsburgh’s (then) Buhl Planetarium and Institute of Popular Science from July 1987 through September 1988 with the help of many volunteers … Baskets of 2.25-inch fabric squares of many colors were available at Buhl for visitors to sign. Kits with squares for signing were sent to schools, cultural and ethnic organizations, dignitaries, sports teams and many others. The signed squares were sorted into the colors of the spectrum and machine-stitched together by many enthusiastic volunteers, who spent over 600 hours putting the more than 32 000 squares together. 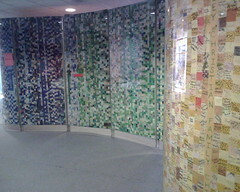 When I wrote about the Quilt Show in 2008 and the Pittsburgh Friendship Quilt– there were no photos of the lost Pittsburgh Friendship Quilt on the internet. So I decided to visit the quilt show to see the friendship quilt for myself and to at least take some photos so that the next person who googled the Pittsburgh Friendship Quilt would be able to see some photos of it. The quilt had actually been lost and forgotten about and thankfully Elizabeth Jones, a member of Quilt Company East went on a search to find the quilt. Once the quilt was located she enlisted a major crew of volunteers to clean and repair the quilt (you just can’t put 20,000 one inch squares in the washing machine.) You can read more about the lost and found story here. 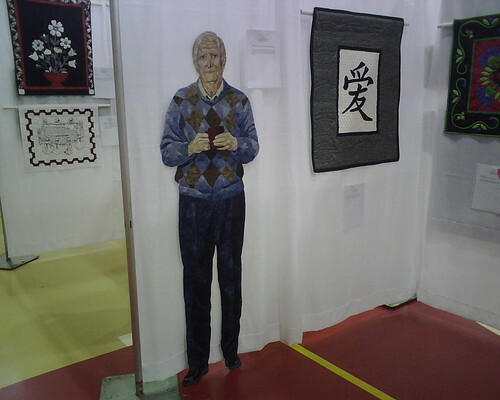 My visit to the quilt show ended up being a really great day – not only did I get to see and photograph the Pittsburgh Friendship Quilt – I met some amazing local quilters and saw some unbelievably complex and interesting quilts (one woman quilted a life size replica of her husband – yes that is a quilt). I am pleased to report that there is now a ton of information about the Pittsburgh Friendship Quilt and photos at QuiltPittsburgh.org. So if you are interested in learning more about quilting and quilting groups in Pittsburgh this is a good weekend to check out the Heinz History Center – PLEASE NOTE – I don’t think the Pittsburgh Friendship Quilt will be on display this weekend. Saturday, Jan. 23 & Sunday, Jan. 24 – 10 a.m. to 4 p.m. The Senator John Heinz History Center presents the third annual Quilter’s Weekend, showcasing the unique history of quilting in Western Pennsylvania and encouraging families to share the tradition together. Visitors will experience a weekend full of hands-on activities, enjoy quilting displays and demonstrations and visit quilting vendors and guilds from throughout the region. This year’s event features a presentation on Gees Bend/Nia Quilt Project by Janice Parks, director, Young Men and Women’s African Heritage Association.